It’s difficult to capture the the life of someone who has had such a far-reaching impact in both Michigan and the entire country. 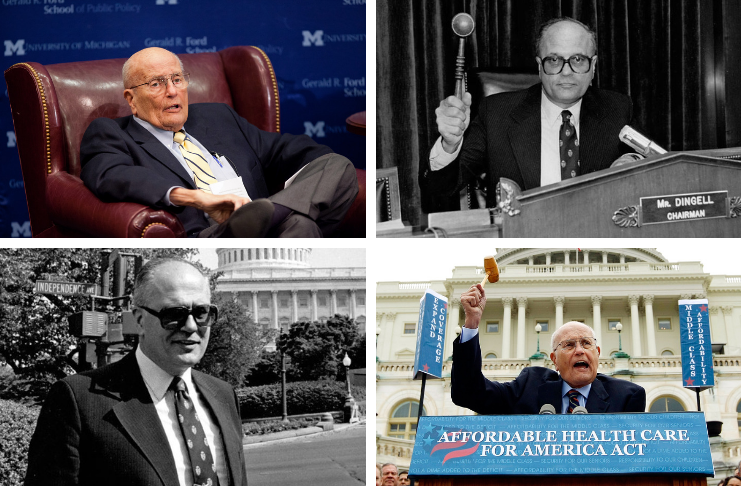 From Medicare to the Clean Air Act, the late U.S. Rep. John Dingell (D-Dearborn) shaped some of the biggest issues in the post-World War II era. He also touched the lives of thousands of people on a personal level. “It is with a heavy heart that we announce the passing of John David Dingell, Jr.,” she said in a statement. “Congressman Dingell died peacefully today at his home in Dearborn, surrounded by his wife Deborah. He was a lion of the United States Congress and a loving son, father, husband, grandfather, and friend. He will be remembered for his decades of public service to the people of Southeast Michigan, his razor sharp wit, and a lifetime of dedication to improving the lives of all who walk this earth.”His wife, U.S. Rep. Debbie Dingell (D-Dearborn), did not attend the State of the Union address on Tuesday to be by his side. They were married in 1981. On Friday, the Washington Post ran one last op-ed from the late U.S. Rep. John Dingell (D-Dearborn) on his vision for the nation. Dingell, the former Dean of the House, died Thursday night at age 92 in hospice care. The column was an eloquent guide to what the country should be and a look at the progress that was been made in his lifetime on health care, the Great Lakes, civil rights and more. “Please note: All of these challenges were addressed by Congress. Maybe not as fast as we wanted, or as perfectly as hoped. The work is certainly not finished. But we’ve made progress,” Dingell wrote. Early Saturday morning, his wife, U.S. Rep. Debbie Dingell (D-Dearborn) — whom he acknowledges in the column for her “forgiveness and sweetness” and “essentially [supporting] me for almost 40 years” — gave the backstory of how it came to be. “I want to share his last few days,” she wrote in an emotional, unflinching Facebook post. WASHINGTON — John Dingell was among President Trump’s most enthusiastic Twitter foes. The longest-serving member of Congress in history, Dingell had a reputation on Capitol Hill for belittling his opponents during his decades as a powerful committee chair. And the Dearborn Democrat never minced words about his disdain for the president.Dingell, who died Thursday at age 92, went from being a congressional icon to a social media icon. He had attracted nearly 260,000 Twitter followers, whom he lured with his signature snark about topics ranging from Michigan sports to political news. I think if Dingell had been asked to choose the issue closest to his heart, it would have been health care. And it wouldn’t even be close. It was also a deeply personal fight. “We’ve known sickness,” the former congressman said of his family, which is a bit of an understatement. His father suffered from tuberculosis and was told (wrongly) at one point that he had only six months to live. His mother had stomach ulcers and died of cancer. His sister had polio and died of pneumonia. “If I wasn’t one of the first to be shot up with penicillin,” he said in that same interview, “I wouldn’t be here talking to you.”As a kid, Dingell had double mastoids. He later contracted meningitis while in the Army. The passing Thursday of former U.S. Rep. John Dingell (D-Dearborn), the former Dean of the House, was marked by many political leaders in Michigan and beyond. Former President Barack Obama remembered Dingell’s role in the 2008 auto bailout that was critical for Michigan.Gov. Gretchen Whitmer called him “one of our greatest leaders” and ordered Michigan’s flags to be lowered in his honor. “Over the course of the longest congressional career in history, John led the charge on so much of the progress we take for granted today. He presided over the vote for Medicare — changing the lives of America’s seniors. He helped lead the fight for the Civil Rights Act — opening new doors for countless citizens. Ten years ago, in a moment of peril, he helped us rescue the American auto industry — saving the livelihoods of one million Americans,” he said. The late U.S. Rep. John Dingell (D-Dearborn) will be eulogized by former President Bill Clinton and former Vice President Joe Biden, among other political leaders who have been longtime friends. Biden is slated to speak at services on Tuesday in Dearborn. Clinton, who spoke to Dingell just before his passing, is scheduled to speak in Washington, D.C. So is Dingell’s longtime friend, U.S. House Majority Leader Steny Hoyer (D-Md. ), who visited him in Dearborn last week. On Tuesday, a motorcade carrying Dingell’s casket will be driven past the U.S. Capitol on the East Plaza.A funeral mass is scheduled for Thursday. Memorial events on Monday and Tuesday are open to the public.